This artwork was donated to Leichhardt Council by Reg Richardson of Security Self Storage, Annandale. In the 1990s Security Self Storage worked out of Beale’s Trafalgar Street building, where the painting had formerly hung in the foyer. 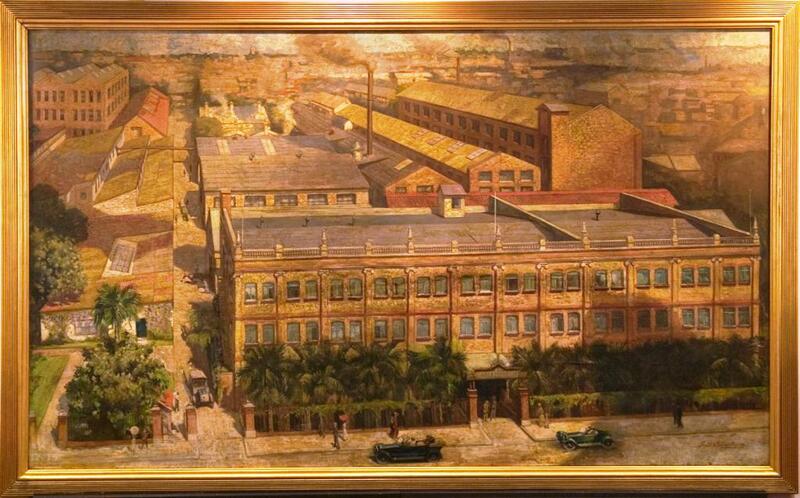 Signed “Smith and Julius Studio” the painting would have been produced in the 1920s. In 1906 Ure Smith joined with fellow artist and friend Harry Julius to form Smith and Julius Studio in Bond Street, Sydney. Drawing on contacts in advertising and with printers, the Smith and Julius Studio set high standards in Australian advertising. Clients of the studio included David Jones, Anthony Hordern and ‘Home’ magazine. A hub for Sydney’s art community from the early 1900s, Smith and Julius employed such artists as Lloyd Rees, Margaret Preston, Roland Wakelin and Thea Proctor. The largest piano factory in the Southern Hemisphere, Beale’s Pianos were known for their fine craftsmanship – in 1908 they won every award in the Franco – British Exhibition held in Paris. Operating for over 60 years in Trafalgar Street, today Beale’s Piano Factory building is an apartment block listed on the register of the National Estate. Hey I know this building! What a great art work. Gives you a feel for the old industrial Sydney now gone.